There has been some almost hysterical coverage over yesterday’s record UK temperature for February, set at Kew Gardens. Inevitably climate change has been brought into the debate. The UK has broken the record for its warmest winter day for the second consecutive day, with a temperature of 21.2°C in Kew Gardens, London. Monday was the first time temperatures of over 20C had been reported in winter, breaking a record that had stood since 1998. It means parts of Britain have been hotter than destinations such as Ibiza….. The BBC Weather Centre said it was likely to be one of the warmest Februaries since records began in 1878…. Dr Friedericke Otto, acting director of the Environmental Change Institute at Oxford University, said people were right to ask themselves whether the record temperatures were being driven by climate change. "I am very confident to say that there’s an element of climate change in these warm temperatures," she said. "But climate change alone is not causing it. You have to have the right weather systems too." BBC science editor David Shukman said scientists such as those at the Met Office were usually reluctant to link individual heatwaves, storms or floods directly to climate change without a specific study to prove it. But he said research had shown that events like last summer’s heatwave were made more likely by the rising levels of carbon dioxide and other greenhouse gases in the atmosphere. Caroline Lucas, the former leader of the Green Party, suggested the warm weather is linked to climate change. She said: "I like spending an afternoon in the sunshine as much as anyone, but it’s impossible to shake the feeling that this isn’t right." Tom Burke, of the independent climate change think tank E3G, said extreme warm weather events were exactly what climate change experts said would happen if people continued to put carbon into the atmosphere. He said: "Temperatures are twice what they would normally be at this time of year. "Imagine if this was the summer and the temperature was twice what it would normally be, and you really begin to get an idea of how serious this problem could be." Note the word SLIGHTLY. And that just about sums it up. The weather we have had this week is just that, weather, which we would have had regardless. Without that slight amount of warming, maybe temperatures would have been half a degree lower, but it would still have been unusually warm and sunny. Daily temperature extremes are not especially meaningful in themselves. If global warming is responsible for yesterday’s record , was it also responsible for the record January temperature set in 1958? Or in March 1968, April 1949, May 1922, June 1957, September 1906 or December 1948, when records, which still stand, were also set? The simple fact is that the warm weather this week is the direct result of the meteorological set up, involving the jet stream pulling up warm air from the tropics, and high pressure sat to the east. Although this is still technically winter, the sun is now high enough in the sky to impart a fair amount of heat, particularly when the skies have been so clear. When we look at daily mean, instead of maximum, temperatures then, we get a much different picture. The above chart plots all days above 10C in February, of which there have been 110 since 1775. The highest reading was 12.8C in 2004. We must also remember that the so called record UK daily temperatures, popularised by the Met Office, generally only signify “records” for the last 100 years or less. There are many more stations around now, where records can be set, than in the past. The record set in 2003 at Faversham, for instance, is pretty meaningless as the station only has continuous since 1998. We simply don’t know if it was hotter there prior to that. Even stations with longer term records, such as Kew, are corrupted by UHI. Taking a longer term view over the month as a whole gives us a much more meaningful picture. We can see that the warmest February was all the way back in 1779, with 1869 close behind, with monthly mean temperatures of 7.9C and 7.5C respectively. Provisionally, February 2019 currently only ties for 9th place, at 6.9C. Although there are still two days to go, CET provisionals nearly always seem to overstate the temperature, so I would fully expect this month to drop further down the list. 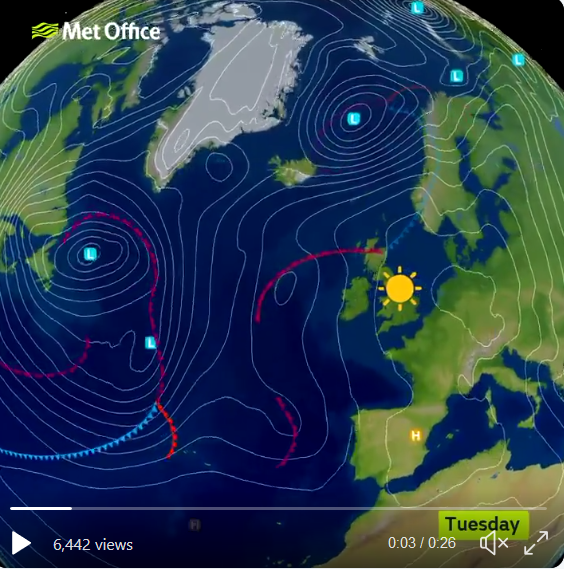 So, despite attempts by the BBC and others in the media to hype it up, there is nothing of any significance about the warm weather this week. Global temperatures are what are important. It may be warmer than usual in the UK but it’s bloody cold here in Canada and most of the US, definitely colder than average. Snow in Greece this week – due to ‘climate change’? One-eyed warmists look away now. But my garden water butts are empty, in February! Unprecedented. Roll on cold and wet March, when they’ll get replenished. I put in two butts last year. My friend told me: ‘they’ll be full when you don’t need ’em and empty when you do’. Global warming was ‘supposed’ to increase winter rainfall. Maybe the wet stuff has evaporated? Reading through Charles Lindbergh’s Wartime Journals, 1970, pages 11-12, he wrote this just outside London on Sunday April 3rd, 1938… 81 years ago. Tony Heller’s site is currently reporting “web server down”. Tom Burke, of the independent climate change think tank E3G, said: “Temperatures are twice what they would normally be at this time of year”. So, Tom, you really think that 20deg C is twice 10deg C? Really? What an idiot. Alan , certainly critically challenged mentally, but his are the comments reported by the BBC and the ones that the nation hears or reads. People like Burke ( is that really his name? just too appropriate) exist partly because of the BBC and its insistence on ill – reviewed reporting for maximum ideological effect. E3G is a powerful but below the radar QGO (quasi-governmental organisation). UN, OECD, Foreign Office, you name it, Burke’s done it, read the full CV at E3G. The Foreign Secretary’s Special Rep on CC was John Ashton, a co-founder of E3G with Burke. In the past they have had other people seconded to the Foreign Office, which is one of the biggest promoters and funders of AGW within the Whitehall agencies. “During 2002 he served as an advisor to the Central Policy Group in the Deputy Prime Minister’s Office, (John Prescott). He was Special Adviser to three Secretaries of State for the Environment “(including Gummer). Was at one time Exec Director of Friends of the Earth. “What they would normally be at this time of year”? Does he mean compared with the average for this time of year? But what is an average? It is based on extremes and everything between. Sometimes it will be hotter than average (or “normal”). Thank you, Paul, for all your work….an oasis of intellectual sanity in our corrupted world. I assume he means 20 deg C rather than 10 deg C – but I wouldn’t accept this from my secondary science students. 10 deg C is 283K, so double the temperature would be 566 K or 293 deg C. No wonder Ian’s water butts are empty – the water’s all boiled away!!! Mr Skipper, Sir, you should accept it from them otherwise you are not doing your job properly as a science teacher! Meanwhile, here in Los Angeles, we just had the coldest Feb in 60 years – averaging about 8F colder than norm. July 25, 1891 – 109 – Still standing as the all time record high for the month of July. Aug 19, 1885 – 106 – Still standing as the all time record high for the month of Aug.
All with no UHI effect. Darn horse flatulence, I suspect. The BBC rolled out Caroline Lucas (Green Party) this evening to tell us this extreme hot weather was occurring all over the world and was due to climate change. As the UK started the industrial revolution, we must be the first to stop using fossil fuels. There is no doubt (and we have recently seen plenty of evidence) that parliament is full of idiots. What about gunpowder in China and suttee in India, shouldn’t they be made to atone for their sins too? Coal fired power stations closed down. Less particles in the atmosphere. High pressure block. More sunshine during the day. Clearer skys at night. Potential for higher maximums and colder minimums. 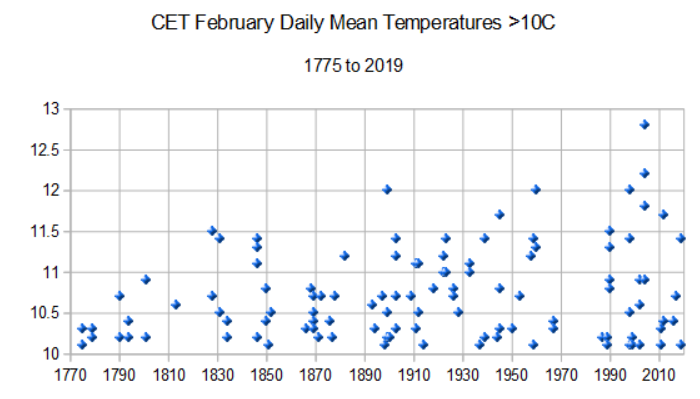 If climate change is responsible for the beautiful and “record breaking” warm weather this week and the “record breaking” cold weather this time last year, is it also responsible for the many benign February’s in the recent past? Yes it has been relatively warm during the day here in our very rural location (North Lincolnshire, UK) BUT night time temps have still been getting to near zero every night over the last week. The maximum daytime temp our weather station has recorded has been +16.7c, yes warm for time of year but not the record the Met Office and media claim. It was actually WARMER here on the 22nd January 2014 when I actually managed to spray paint my Land Rover outside. The media is just all fake news now, no quality journalism or fact checking going on at all. In fact we had to light a fire over the weekend as the house was quite cold, only getting to a max of 12c a couple of days this last week. We’ve had dense fog several days that has lasted right through till midday so has prevented the sun warming the house, coupled with freezing temps overnight it is certainly not warm enough to turn heating off which is what you’d think from reading the headlines. Sure, people living in large concrete jungles will have warmer temps due to UHI. They’d be in for a shock if they actually moved to the countryside! I also chatted to a colleague this morning who lives near Southampton and it has not been much warmer there, barely 1.5c warmer than up here, with overnight temps dropping to just above freezing, so my experience is not just local weather. 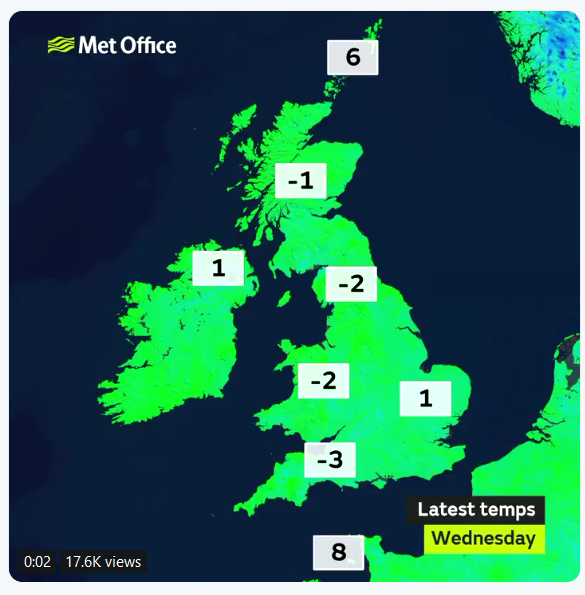 Our home weather station always shows significantly colder temps than the met office official figures for our region in winter (typically 3c less but as much as 10c less in severe cold weather) mainly because they keep using urban/city locations for their weather stations. As concrete jungles make up what, 1% of the global landmass? 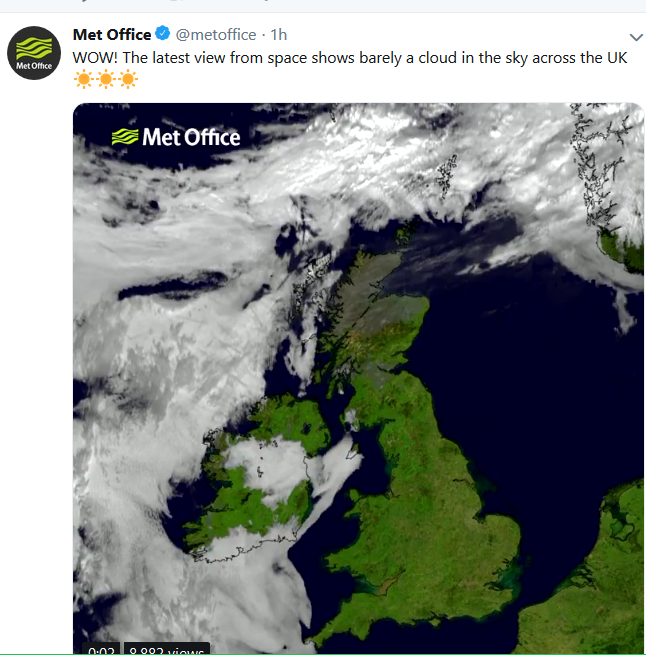 I would suggest the Met Office scrap all its weather stations located near concrete, tarmac or in urban/city locations and instead use rural locations. Of course they won’t do that because overnight global warming would die a death. Curiously in summer our weather station matches the MO claimed figures quite closely which is further evidence that they are basically measuring UHI which is worse in winter due to waste heat from buildings. I’m on the South Coast and the sea very much limits temperatures this time of year, we haven’t reach 14C this ‘heatwave’ and have had a ground or air frost every night bar 1 or 2. The other thing about the temps this time of year is that the highs only last for an hour or three before dipping down again – the daily temperature profile is completely different to a day with a 20C max. temp in summer. And trying to blame this weather for a few malicious wildfires set around the country, desperate stuff. Yes, we’ve noticed that, it is only really ‘warm’ for a couple of hours around midday. Even when the sun is out, in morning or later afternoon the temperature is cool, very cool in the shade. I was trying to spray paint some plastic models outside today, it looked warmer than it was. I had to wait till 1pm before attempting to spray but even then the first attempt failed as the humidity was still pushing 70% and the temp was only 16c. I still had to wear a jacket in the shade, it certainly wasn’t t-shirt weather here! In Devon we have had some very pleasantly warm afternoons, but it has been cold enough each following night for ice to form on our ponds. On average, temperature-wise it has probably been fairly normal, but nice and dry. The only thing extreme about UK weather are the kult of weather prognosticators and rune readers sat in Exeter and varied other Met office centres across the UK.. NB, not forgetting of course their clarion trumpet ensemble named the beeb and all of ’em neither civil nor servile – holidaying large on the UK taxpayer ticket, all of it done at your expense and remember that well. What really makes me laugh is the hypocrisy. Pointing at a small localized area of warm weather as indicative of climate change. Ignoring massively widespread cold at the same time/latitude. I remember discussing the theoretical maximum temperature in Jan/Feb a few years ago and I hypothesized the weather pattern we just had, and guessed that if it stuck long enough you might make the mid-20s. It is just random chance – and what could more perfectly illustrate that than the fact that with the conditions breaking down now, they have lasted almost perfectly for the calendar month of February. The other thing to note is that there was almost similar warmth in England at the end of February 1891 – peaking at 67F/19.4c. Not so very different from today. And in both 1948 and 1950 temperatures exceeded 70F/21C only a week later than now, I think peaking at 74 or 75F in 1948 Again these were down to similar pressure patterns to this year. I presume in times past everybody just enjoyed the random warmer winter temperatures, now we’re hectored by Caroline Lucas instead. And another thing – be grateful it’s mild because wind has gone AWOL again for the last 2 days – about 2% of pretty modest demand. Yes and to put that in context, we are currently (as I type) importing 8% from France and Holland via Interconnectors and that is under very modest 39GW demand, almost as much as the total UK renewables output. What a joke. I cannot resist the temptation to add a few observations of my own here. Firstly, I went for a long walk this afternoon in glorious sunshine and really object to the Caroline Lucases of this world wanting me to feel uneasy and/or guilt-wracked about it. I have studied weather and climate since the 1960s and can recall unusual warm, sunny days in January 1971, let alone February 1998 – this is weather, not climate, and away from the Jet Stream spike which has allowed such a warm airflow to reach us it has been colder and snowier than normal in, as evidenced above, the north west USA, and also in east central and south-eastern Europe (heavy snow in Greece). This too is weather, not climate. Secondly, on my sundrenched ramble in the hills today I noticed, again as others have noted, that in the deep shade it was not only pretty cool, but also a few puddles of static water still had ice at their edge from an overnight frost. Next, the linking of wildfires with climate change. Anyone living in hill country knows there are two main conditions for wild fires burning heather and bracken and smouldering sometimes for weeks in the peat below ground. Long hot summers dry out the surface vegetation and create the conditions for fire to spread rapidly, but late winter is much more dangerous as the ferns are all dead: perfect dry tinder for any flame to capture. Heath and moor fires are not caused by climate change and the linkage is absurd. Even more asinine is the oft used phrase that temperatures are “above where they should be”. Averages are just that – the average of many different readings. They are not a prescription for perfection. Is this so difficult for climate change warriors to grasp? Sadly, the beautiful weather, which may well – Ms Lucas take note – have reduced the toll of excess winter mortality, is coming to an end. The only thing that puzzles me is where all the global-warming-induced increased rainfall has fallen. My time is divided between normally pretty wet areas in Wales and West Yorkshire and it certainly hasn’t been drenching either place. “Is this so difficult for climate change warriors to grasp?” It certainly is – they don’t do statistics or anything technical. 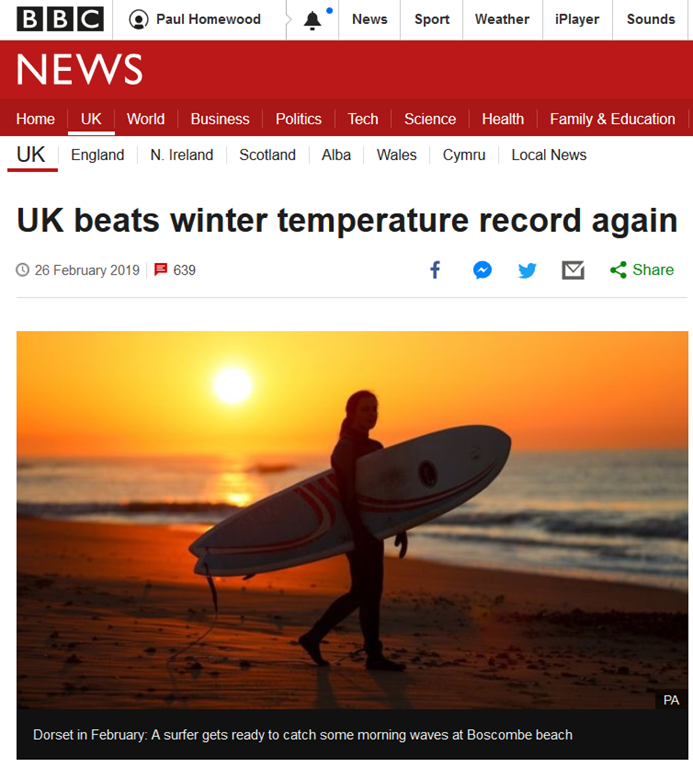 If you follow the link in the article https://www.bbc.co.uk/news/uk-47360952 The Burke quote about the temperature being double the normal for the time of year seems to have gone AWOL. My friend Eric who lives in North Yorkshire complained to me today because he had to mow the lawn. The temperature was over 20 C. Here in sunny North Carolina the grass is not showing any growth and the temperature is <10 C in the mid afternoon. Eric is suffering from "Climate Change" while I am suffering from "Weather". I have a friend who lives in Charlotte, he mentioned the other day that it had been a very wet winter there, cooler and wetter than usual. It seems whenever he has colder than average weather we have warmer than average and vice versa. I guess it depends on where the ‘lobes’ of the polar vortex sit? I guess numerous factors involved, eg which phase of QBO we are in. I think in easterly QBO the cold tends to sit of the UK, westerly QBO cold tend to sit over North East US? It was really wet in North Carolina last year and not just because of hurricanes. This year has continued the pattern and given that most of North Carolina is made of red clay things are pretty soggy right now. 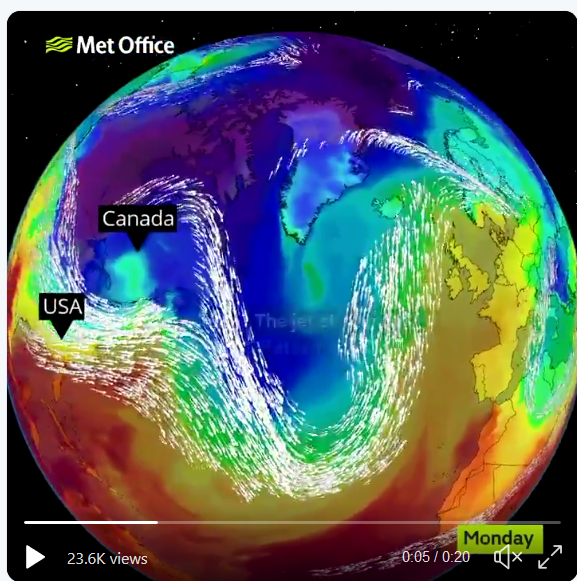 However we are doing much better than folks who are a few hundred miles north east of us thanks to that jet stream thingy or should we call it a polar vortex? On the 28th February 2018 the average UK max temperatre was -1.8 degC, the min temperature was -6.0 degC and the mean temperature -4.0 degC. Oh what short memories these alarmist have. Solid evidence of climate change Neil. /Sarc off. In terms of the mean daily maximum temperature for the whole month of February, Feb has been cooling significantly since 2000, so much so that the month is now nearly as cool as it was back in 1910. 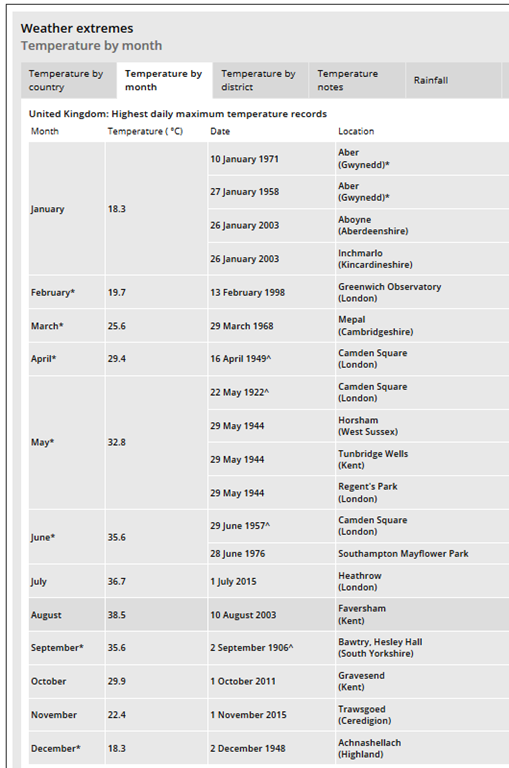 The coldest UK Februaries this century occurred in the 60s and 70s – unsurprisingly. It’s highly unlikely a few exceptionally warm day time temperatures in late February 2019 – due to weather – are going to have much impact on the overall trend. It is very noticeable from Paul’s list that the highest monthly temperatures are either from areas prone to foehn or areas where the UHI is high. When the met office do their research on the effect of climate change on these warm February temperatures I hope they take not that the difference between min and max temps are extremely large, something that would not happen if GHGs were to blame. Just goes to show how important water vapour is as a GHG. I assume that it was dry air that accompanied the warm weather? Could somebody do a calculation of the total heat released to date by the burning of all fossil fuels since coal mining and oil and gas production started? Obviously that is a large part of the UHI effect, but that heat – plus the solar radiation absorbed by all the concrete, brick and tarmac – just goes into the atmosphere and spreads round the globe. It eventually radiates into space, but only after raising the mean atmospheric temperature. This will continue to happen even if all our heating, cooling and manufacturing use renewable or nuclear energy: they still put the same amount of heat into the atmosphere. Adding more CO2 to the environment has not been a tremendously good idea, and it will inevitably raise the mean temperature slightly further, but is it the main driver? Is it the main driver, you ask, but is CO2 a proven driver anyway? You cite the effects of black tarmac around the globe (a pretty much 20th C phenomenon) and the effects of city expansion & building skyscrapers with concrete & glass (again, a pretty much 20th C phenomenon). To that I would add a trebling (+/-) of heat producing human bodies (a specific 20thC event continued into the 21stC) – and increasingly well-fed human bodies (therefore more warmth) in 21st C at that! – notwithstanding the conflicts throughout the 20thC that killed many but released heat from the immense number of bombs & bullets used. Add to that last warming cause all the ordnance used from weapons in 21stC (in 15 years more than in whole of 20thC, have I heard somewhere?) and human induced global warming is plain to see. Except for members of the IPCC and all who now believe their every word. It is only motor cars that cause Global Warming. Oh, and aeroplanes. And, maybe cows. Yes, cows. And sheep. I think that the heat produced by one human is approximately 1/3 of a kilowatt, which means that every three humans are equivalent to a 1kw heater. The population of the UK is equivalent to 22 million such heaters, and that of the world to about 2.5 billion. I remember strolling in Paris in a heatwave in February 1974 or thereabouts. But far too often on the West of Scotland, I ended up on the wrong side of the jet stream with no hint of any warming throughout entire summers. People who attribute every change in weather to climate change should be publicly ridiculed but the BBC and newspapers do their best to spread the nonsense.